DENVER – Armstrong Steel Building Systems is pleased to announce the inaugural contribution for the launch of Armstrong United, the company’s philanthropic foundation, awarded the first gift of $2900.00 to Peyton Manning Children’s Hospital at St. Vincent in May 2014. Armstrong United made the contribution to Peyton Manning Children’s Hospital at St. Vincent for each building that Armstrong Steel sold for a month long period. In addition, customers were asked if they’d like to supplement Armstrong's contribution to the project and Armstrong United matched those donations dollar for dollar. Armstrong United made its initial pledge during an on-air telethon benefitting the Children’s Hospital in the spring of 2014. “One hundred percent of monies raised through the telethon went to the Peyton Manning Children’s Hospital at St. Vincent,” said Sue Anne Gilroy, executive director of the St. Vincent Foundation. The Children's Hospital at St. Vincent offers, "pediatric services, state-of-the-art facilities and a friendly atmosphere," according to the hospital's website. In addition to its Customer Matching Donations, Armstrong Steel donates to organizations that are important to it’s employees and customers such as the United Way, Project Angel Heart, Habitat for Humanity, Dumb Friends League, The Denver Museum of Nature & Science, the Children’s Diabetes Foundation, the Denver Art Museum, Boys & Girls Clubs of America, the Denver Art Museum, and Boy Scouts of America. The foundation is sponsoring a team of cyclists who will take part in a long distance ride benefitting MS in late June 2014. Armstrong United exceeded its guaranteed minimum pledge of $2000. 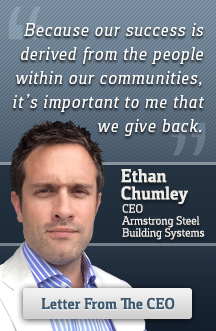 “Giving back is not just a corporate commitment, but a way of life that resonates with our customers and all of us here at Armstrong Steel,” says CEO Ethan Chumley.